I can’t believe it. All these years without the right clothes on my body. My one and only body! But then, cheap and stupid is how I used to roll. “USED to?” Why yes, absolutely. Nothing in my way but habit. Not exactly like saying you’d be tall if you weren’t short, but close. So what do I do when it snows like that? [above] For my entire life, I’ve relied on some variant of the Old Rubber Boots routine. Yes, they’re cheap. The ones I have now came from Canada by way of Walmart and were great for clomping through mud until the right boot sprang a leak. But in the snow, my feet freeze right up (no insulation). This isn’t supposed to bother me, because I’m semi-impervious to cold if there’s a game involved, like “let’s see if I can walk out to the wood pile barefoot.” Some people use hot coals, right? But I already dropped a blob of molten bronze down inside a laced-up boot once—the smell shocked way more than the pain—so this playing field is ice and snow. The thing is, though, with proper footgear, the outdoors is transformed. 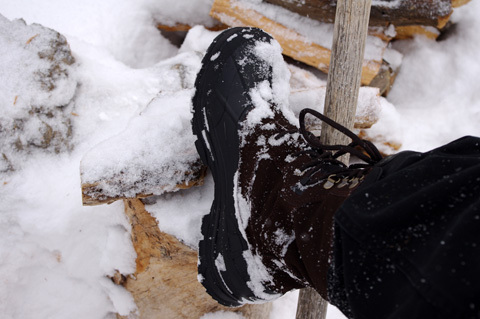 I wore these while I used a broom to knock six inches of fresh powder off the wood pile, and it felt like I could have stayed outside all day. Without the hurry-up from being cold, I was happy on a winter’s day. Everything around was still and quiet. The snow was beautiful and fascinating, rather than an aggravation. It was just a privilege to be there. Beautiful photos. Thanks so much. Nice layout too. Ooops! this is the second try. This form only accepts one web address. So here goes again. I like this site. The photos are awesome, but I miss the list of comments on the sidebar. But it’s OK, the photos make up for it. I miss the comments in the sidebar, too. (Oh well, got no sidebar.) A list of them, if not the actual comments, is on the Dashboard page, though, and I can stick them anywhere. Ideas?